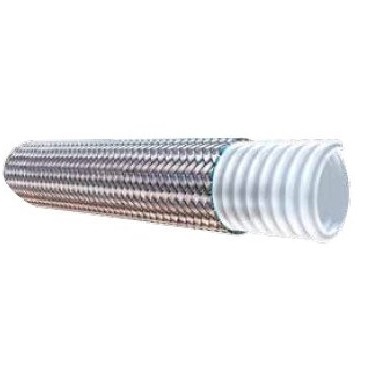 Low-medium pressure full vacuum hose. Extra heavy duty construction with an open pitch convoluted inner core design. Used in applications such as; chemical processing, pulp and paper, foam packaging and air compressor discharge. Extra heavy duty construction with additional wire support provides the ultimate in flexibility for use in full vacuum conditions. A variety of hose ends are available in carbon steel and stainless steel to complete your custom hose assembly.